Awarded with the Austrian Theatre Prize ‚The Golden Schikaneder 2018‘ as the best female title role interpretation of RUSALKA at the Innsbruck Municipal Theatre . Such was the review in the magazine „Die Deutsche Bühne“in autumn 2015 on her debut as ABIGAILLE in „Nabucco“ at the Pforzheim Theatre, where she also enjoyed a great success as POPPEA in Monteverdi’s “The Coronation ofPoppea”. Her brilliant performance in Nabucco has brought her to be engaged again as ABIGAILLE at the Leipzig Opera for the season 16/17. This season she also appears as ABIGAILLE at the Theatre Würzburg and in the Opera House from Innsbruck in the Title role of Dovrak’s RUSALKA. Subsequently, Anna-Maria Kalesidis was a finalist at the 17th International Singing Contest “FERRUCCIO TAGLIAVINI”, the 22nd International Singing Competition “Clermont-Ferrand” in France and semi-finalist at the International Singing Contest “Competizione dell´ Opera” 2010 in Dresden. In 2013 she won the first Prize at the International Music Festival "Komitas" (Prötzel,Germany). In 2010 she received the 2nd Prize at the International Singing Competition “Vrable” in Slovakia and the 1st Prize at the International Festival- Dobrice/Albena Competition in Bulgaria. Since 2006 she has regularly guest performances in various roles in her native town St. Petersburg, debuting here as MUSETTA in „La Boheme“, TATIANA in “Eugen Onegin”,MARFA in Rimsky-Korsakow’s “The Tsar’s Bride”, IOLANTA, CONTESSA in “Le Nozze di Figaro”, DONNA ANNA in “Don Giovanni”, LIU in „Turandot“, GIULIETTA in „I Capuleti e i Montecchi“ and NEDDA in “I Pagliacci”. 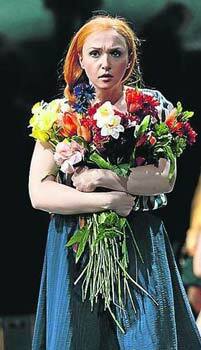 In the season 2012-2013 she was EMMA in „Chowanschtschina“ in the new staging from Andrea Moses at the Weimar National Theatre and CLEONILLA in „Ottone in villa“ in the concert hall Frankfurt-Oder. With KarstenWiegand and Nicholas Milton she worked out her first FIORDILIGI for semi concertant performances with the Jena Philharmonic Orchestra.At the Oldenburg State Theatre she portrayed TATIANA in “Eugen Onegin” Besides, the young soprano sang PRINCESS OLGA in J. Matthison "Boris Godunov" at the performance in Hamburg. Further portrayals of this very role took her to Moscow and Saint Petersburg. In 2010 a DVD of this production was released. Concert engagements brought Anna-Maria Kalesidisa.o. to Armenia, Germany, China and Russia. She regularly gives concerts with the Jena Philharmonics. She sang Wagner’s „Wesendonck Lieder“, Strauss‘ „Vier letzte Lieder“ ,“Les nuit sd´ete“ from H. Berlioz and songs and arias from Brahms, Schumann, Rachmaninoff, just to name a few. In the season 2016/17 Anna-Maria Kalesidis enjoyed great success as RUSALKA in a new production of von Dvorak‘ opera at the Innsbruck Municipal Theatre. As ABIGAILLE in ‘Nabucco’ she equally succeeded in a new production at the Wurzburg Theatre and also impressed in this very role at the Leipzig Opera. In summer 2017 Anna-Maria Kalesidis sang in the world premiere of ‚La Signora Doria‘ at the Rostock Popular Opera. Among her next engagements are KATJA KABANOVA in the title role At the Freiburg Theatre. As DONNA ANNA in ‚Don Giovanni‘ and MICAELA in ‚Carmen‘ she returns in 2018/19 to the Innsbruck Municipal Theatre. With her bright soprano voice Anna-Maria Kalesidis sings a naïf Luise, Liliom’s and Julie’s daughter. Micaela, the fourth leading role was sung by Anna-Maria Kalesidis; a Russian soprano with Greek roots. Her Micaela was not at all a shy country girl, but a self-confident, young woman, who knows how to defend herself against the soldiers’ encroachments. She underlined the character with her clear, powerful voice and sang a very present Micaela. Which was necessary, especially in the duet with Don José. With Manna-Maria Kalesides, the opera about women’s love and suffering has found a fantastic interpreter: a lyrical, almost girlish soprano voice, yet capable of singing great emotions, without ever making them sound too dramatic. Undoubtedly the true star of the evening is the Russian soprano Anna-Maria Kalesidis as Katja. Not only because she succeeded in effortlessly singing the whole night through but also because of her dramatic soprano and her astonishing play: her increasing madness, her desperation after Boris has stood her up and above all her outburst during the storm, when she confesses her husband and her mother that she has an affair, all this will remain in the visitors’ memory for a long time. With her polarizing play Anna-Maria Kalesidis earns thundering applause from the audience. In her beige coat and her grey skirt, her appearance reflects the rural and emotional tristesse, in which she is captured. However, she develops such expressional power - one moment squeaking in madness, the next crying out of fear – she only needs her voice to differentiate from her surroundings. 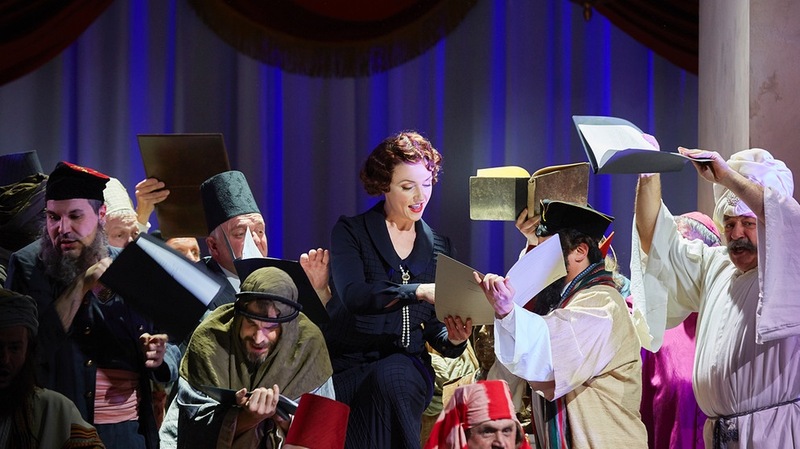 Anna Maria Kalesidis surprised as Abigail with her powerful, round soprano voice, secure in all registers. Anna-Maria Kalesidis perfectly masters the difficult role of Abigail. In her multifarious interpretation she always succeeds in showing the disappointed woman, who feels betrayed by life and love, behind the mask of lust after. Anna-Maria Kalesidis is an Abigaille with perfect, brilliant peaks and a terrifying rage. But the heart and soul of this production was once again Anna-Maria Kalesidis. The young foprano from St. Petersburg entirely indentified herself with Thilo Reinhardt's coherent directorial concept (and Paul Zoller's fantastic stage concstruction) and delighted the audience with her wonderfully flourishing, heart-melting, noble soprano voice. It is not suprising that she , just like all her musical sollegues, received long-lastind standing ovations. Anna-Maria Kalesidis is a truely maidenly Rusalka, who, arousing and dreaming and finally mature, exhales her beautiful soprano voice. 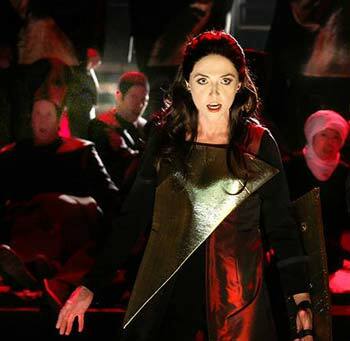 ..., brilliant Anna-Maria Kalesidis' soprano as als Abigail – how brilliantly she plays the role of the rejected lover and the power-hungry slave and how expressive her facial espressions as she hold her birth certificate in hands. Outstanding Anna-Maria Kalesidis as Abigaille with her expressive play and her vocal brilliance. With bravura Anna-Maria Kalesidis masters the difficult part of his stephdaughter Abigaille. Dramatically highly artistic was Anna Maria Kalesidis in her multifaceted portrayal of Abigaille. She excellently transmitted Abigaille's extreme greed for power but also her enormous fear of loss. Also vocally, she convinced with a flexilble, coloratura-prooved soprano voice which was in all registers perfectly focussed. With her dramatic-expressive soprano voice and her intense portrayal Anna-Marias Kalesidis truely met the demands of the part. As Tatjana the Russian soprano Maria Kalesidis is totally convincing. Her powerful soprano voice seamlessly mastered all registers and beautifully managed to impart the young girl's emotional commotions. The guest singer Maria Kalesidis impresses with her multifarious soprano voice and the talent to differ, just by her timbre, Tatiana the mature woman from the vulnerable young girl. 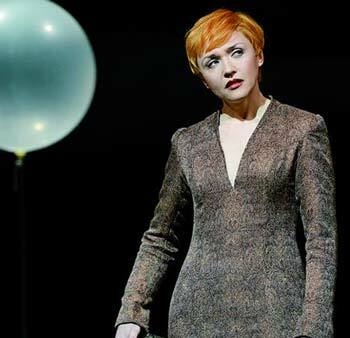 Julia Hölscher's Oldenburg production fully relies on the presence of Maria Kalesidis. Especially in the first part, until the scandal at the ball, the stage definitively belongs to her Tatiana. Not only litterally - she leaves the stage only once in the first part - but also vocally and dramatically. With her clear, melodiously carried voice, Maria Kalesidis succeeds in passionately and deeply emphasizing some expressive features.